Hold up! Wait! We know that you’re just itching to get that pool installed and ready to go in your backyard so you can take a dip as soon as possible, but hold your horses.There are some things that you should consider before you dive and start chatting with a pool builder. 1: What are your local pool regulations? Your local regulations will strongly dictate what you are allowed to construct for your pool. If you have some amazing, grand plan in mind, but have no idea about your local regulations, then you might be in for a bit of a rude shock. It pays to check out your local area regulations, as well as your state regulations surrounding swimming pools as well as their construction. You don’t want to get so far down the path and have to turn around again! 2: What is your budget? Budget is obviously going to dictate what you will be able to get from your concrete swimming pool. There are some of the important costs that you might not have contemplated as yet. For instance, have you thought of the cost of earthmoving services, mainly if they end up hitting a rock? Some pools need to be lifted in via crane, do you know how many cranes hire costs? [Hint: it’s a lot] How about the surrounding pavement around your pool? How much is the mandatory fencing that you need to install going to cost? These are all valid budget questions. 3: Who will be using the pool? There are key differences in the way that adults and children use swimming pools, and what depths and features are mostly catered to which. If you have a pool that will be used primarily by children, then this is something that you will need to take into account – perhaps one end more suited to kids and one end more for the adults. For pools that are really for adults only, you don’t need to worry about shallow ends and such things as much. 4: Do you want an attached spa? Attached spas are very in vogue right now and rightly so. They’re a great way to relax without having to jump in the pool, especially if you have plenty of comfy seats and spa jets. Spas are quite configurable, so if you want an attached spa, then there are some things you’ll need to decide first, like whether you want a hot water spa or one the same temperature as your pool. Or how about how many seats the spa is going to have? How many jets will it have and will it also having a bubbling feature? 5: How big are your access ways? Access ways are critical when you want to put a pool in your backyard. If you are doing major works, then it may limit the extent of what you can easily do. Dragging dirt out of your yard with a wheelbarrow instead of with a Bobcat is going to be a nightmare experience and probably cost you a lot of labour, for instance. Measure your access ways and have them on hand to tell your pool builder before you jump into doing anything, so they know what’ll be possible given the access to your yard that they have. 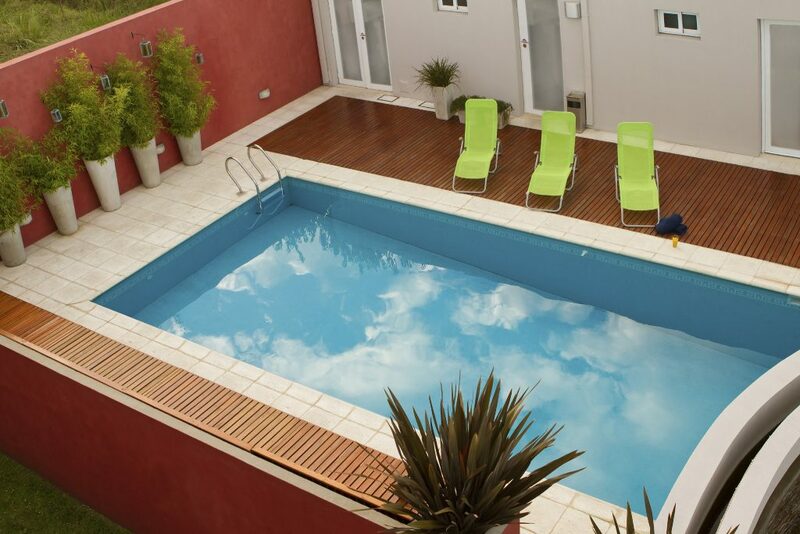 With in-ground pools, you have the option of going for concrete or a fibreglass design. Each has their own merits and drawbacks, so weigh up the possibilities of both before making a decision. You can chat to your pool builder about this if you’re struggling to decide on the right one.